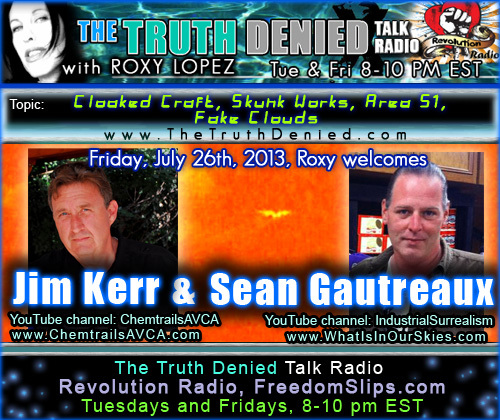 Guests: Mr. Jim Kerr, Mr. Sean Gautreaux, and film/photo/video analyzer Sherry Bunker (aka Ms. American Bunker! Listen to the show right now! As you listen to the show, please scroll this article for referenced videos and still photos that are made throughout this entire program! (NanoCraft) Military, Corporate, Alien or Demonic or all of the above? The vast majority of craft do not seem to be solid objects. Their signatures at times appear solid but I have captured jets spraying chemtrails directly through the center of these craft indicating they are not solid objects. Could some of these craft be some type of computer controlled nanotechnology, swarm technology? Maybe there is no cloaking, light bending technology associated with these craft. Maybe the swarm of nano particles form these shapes then the formation separates or dissipates . If these were solid, wouldn’t there be mid air collisions with normal air traffic? Advanced nanotechnology, metallurgy or biological? Or both? Could this be actual craft formed using some type of Nanotechnology / swarm technology. Intergraded Nano machine components for propulsion, for emitting cloud like material, toxins, smart dust. If this is NanoCraft – nanotechnology, is it being released through chemtrails, released from black budget bases high in mountain areas via spray ejected into the atmosphere using some type of apparatus. Smart Dust. Mongolians disease. The connection? Craft patterns (observed in one area of the Antelope Valley), travel with what seems to be a intelligence design, travel in distinct different directions, High winds have no affect on them. When they are deployed some travel east, some north, some west. They basically get set up for the days agenda of blocking the sun. The ones that travel east begin to expand or seem to multiply (self replicating? Or an unbelievable number of them) blocking the morning sun. The ones that travel north multiply to cover the noon sun. The ones that travel west set up remain dormant until the afternoon and setting sun. Are we breathing this nanotechnology? What effects on us? Why are they exposing us to this? 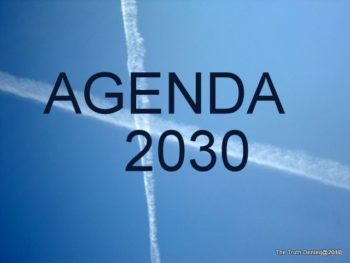 Agenda 21, NWO, depopulation, control of the population? 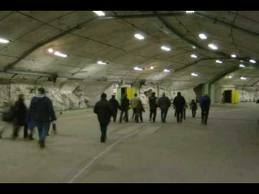 Can HAARP control this nanotechnology? Mongolians disease. Could a reduction in chemtrail activity in some areas be due to alternate ways of releasing toxins, smart dust through the deployment of these NanoCraft. 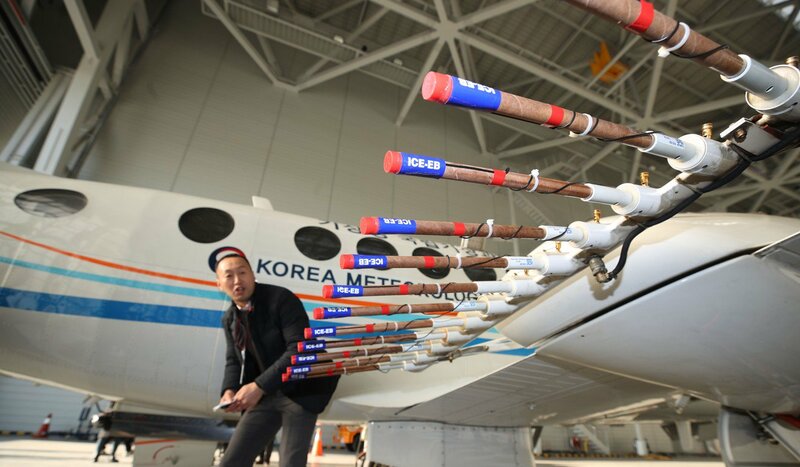 Chemtrails play a significant roll with these craft. I believe there are different chemtrails for different applications. Why are they targeting these craft with chemtrails? Are they adding more NanoCraft? Are they mixing something into the nanotechnology? Fuel? Activation catalyst? I believe this theory of NanoCraft is a viable explanation to these cloaked craft. More research is needed. Strange cloud formations (Chemclouds) are somehow associated with these NanoCraft , High UFO activity, UFO’s spraying unknown dark colored substance over populated areas. 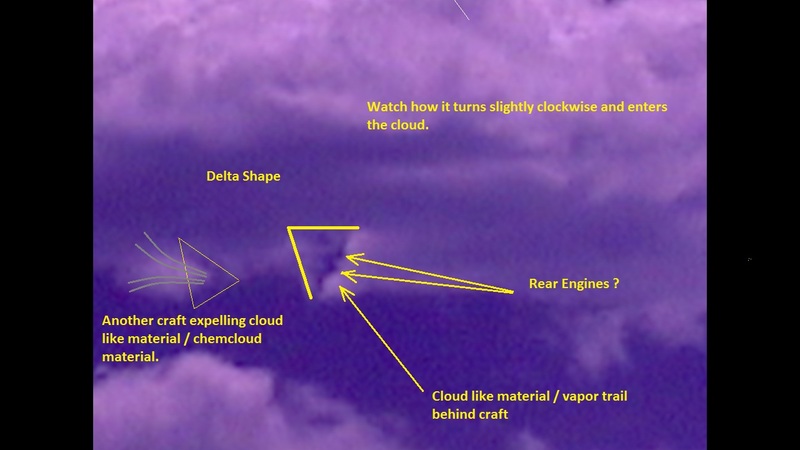 I have observed and photographed cloaked craft (NanoCraft) and UFO’s below strange cloud formations (chemclouds). 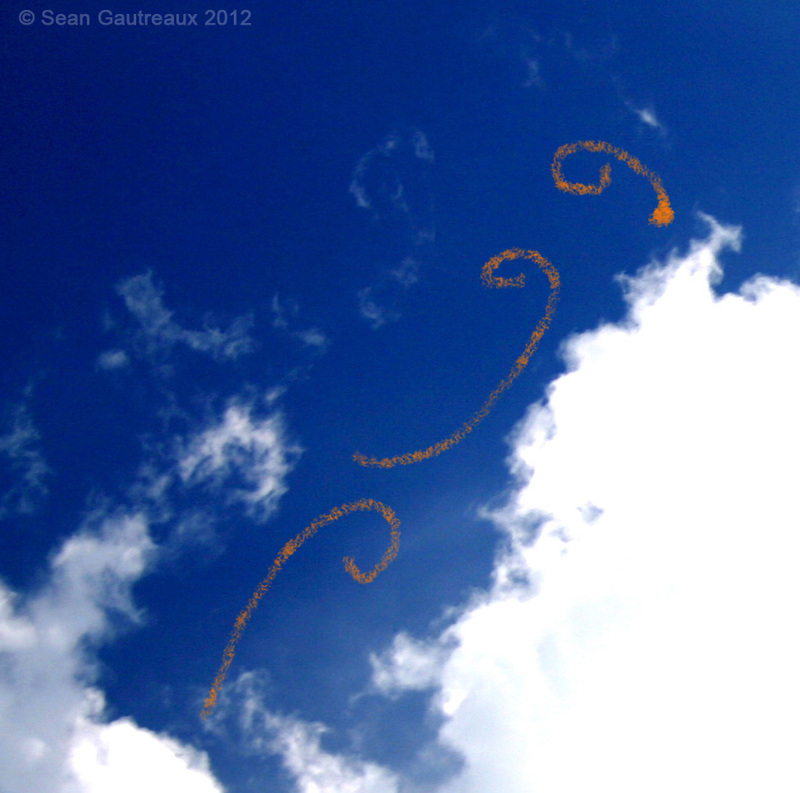 These clouds have a reoccurring similarity or signature. 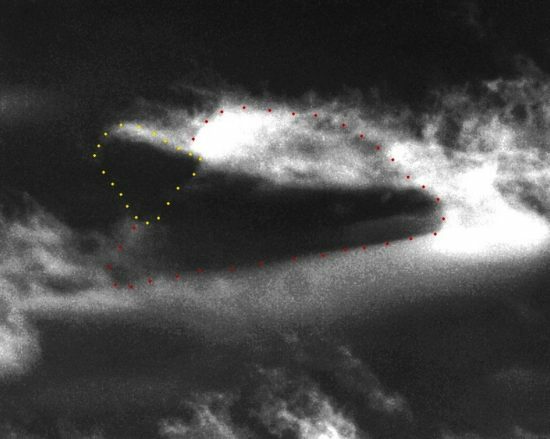 So when I observe a cloud formation with this signature, more times than not UFO’s can be captured along with cloaked craft signatures. UFO’s spraying dark colored materials over populated areas. See photo. Signature cloud formation over the City of Palmdale, Ca. 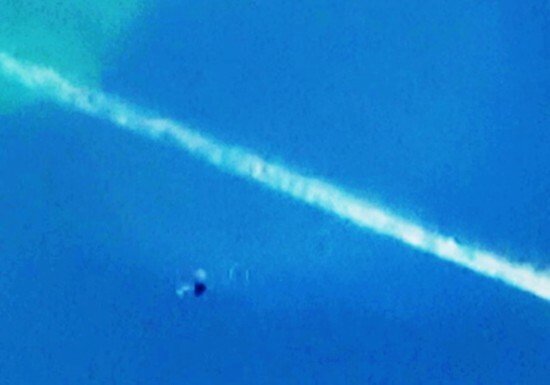 A strange shaped craft can be seen with a dark spray material being ejected as it turns in a very tight flight turning path. 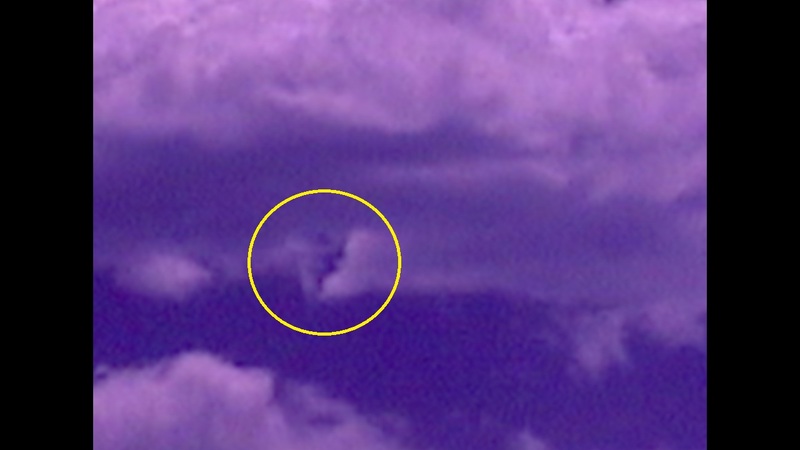 Cloaked craft are also present under the cloud along with much smaller UFO’s. This is not a onetime capture. 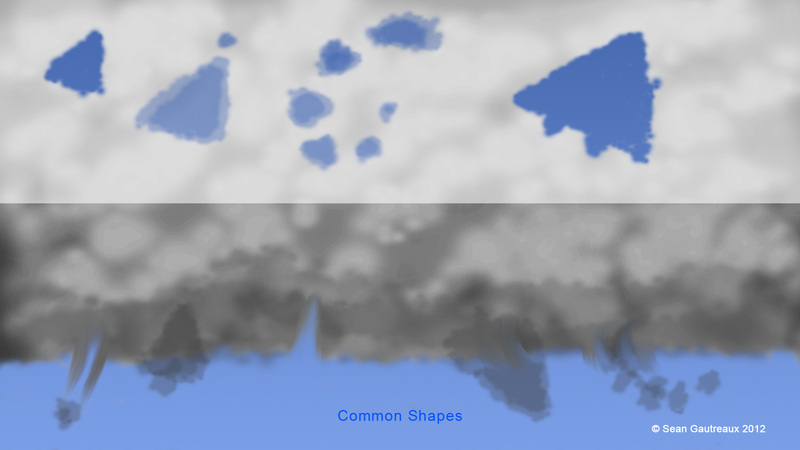 When I see this particular type cloud strange anomalies can be found. Video Link: http://www.youtube.com/watch?v=wRFr52NVIKs The object at 1:42 is not a bird. 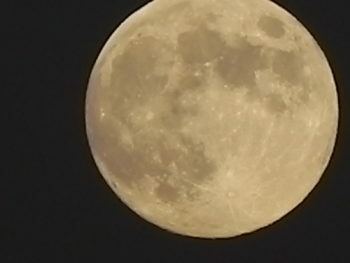 At the distance photographed, 15 miles, with a 200mm lens. If it was a bird the wingspan would have to be 50-75 feet. Capturing these objects on video. 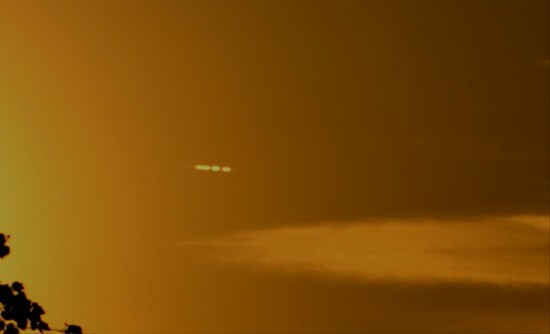 I have not been able to capture these UFO’s on video only DSLR still photos. I believe these objects are moving at such a high speed they cannot be captured due to standard frame rates and shutter speeds of standard camcorders. My captures have been using a Nikon D2XS or D700 with manual settings and high shutter speed settings. Nikon 200mm lens. A high speed camcorder, high frame rate would be needed to capture these fast moving objects. What are these strange craft that are spraying this dark material? Black budget craft? What are they spraying and why? 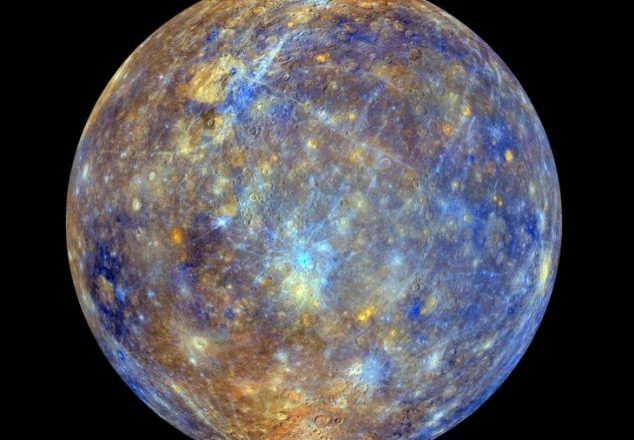 Smart Dust? Slower moving UFO activity over the Antelope Valley, Ca. / aka, Aero Space Valley. Here is where high strangeness goes off the map. As if it’s not already strange enough!!! I believe there are more players in our skies than just the Military Industrial Complex or private companies and corporations. We are seeing a mixture of different events / participants. It is getting difficult to discern who is who. I saw my first two UFO’s back in 1973. 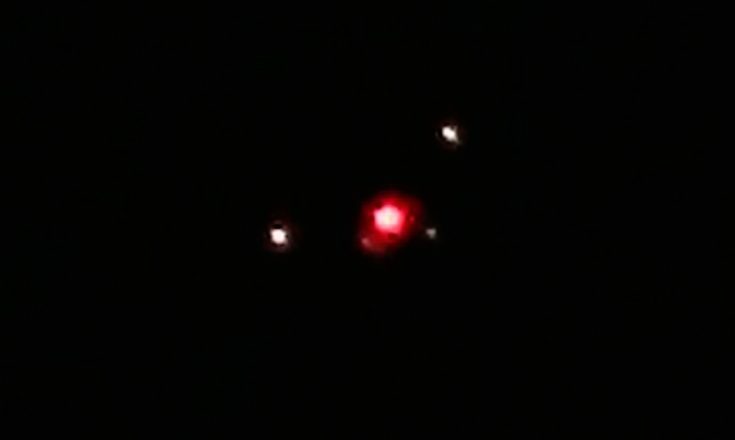 I am seeing, videoing and photographing the exact same type UFO’s I saw in 1973 today in the Antelope Valley, Ca. Along with other shapes of UFO’s. I am not a ufoligist . This all came with along with documenting chemtrails. All I wanted to do is be a chemtrail activist. I got more than I bargained for. Much more. The UFO type I am talking about here is an illuminated disk shape or oval object. It is illuminated within its self, radiating no light. Various sizes. Some are attracted to chemtrail spray and the jets spraying the chemtrails. Why? I am not alone in seeing these UFO’s and the sighting frequency has drastically increased in the past year. It is not uncommon to see up to 10 per week. Actually, it’s gotten to the point it’s no big deal seeing them. My wife will walk into the house and say, A UFO just flu over the neighbor’s house. My son will come home from work in the morning, dad, I saw numerous UFO’s last night in a dogfight shooting plasma like beams at each other. Unknown Entities possibly associated with ROD’s, alien or the demonic realm? Interdimensional. Over and on the ground in the Antelope Valley, Ca. / aka, Aero Space Valley. I personally do not believe in aliens / extraterrestrials. There are volumes of testimonies indicating this is interdimensional activity and evidence of demonic activity and realm. 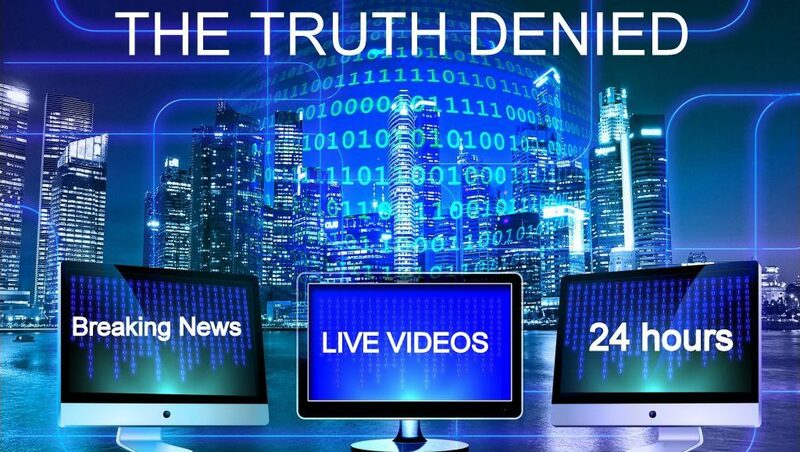 Most people do not want to know what evidence is in the Bible relating to so called alien / demonic activity. If people would do their own research of the Bible they would be blown away. It is a book of the supernatural and supernatural events. 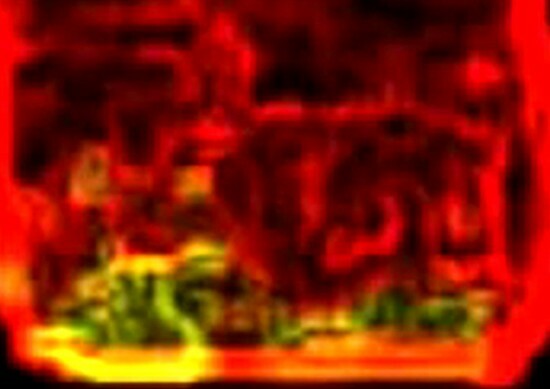 This is a replacement link for the video we discussed where Sherry analyzed Mr. Kerr’s video and found the green entity crouched on all fours in front of a old spanish style looking building. First photo. Craft expelling unknown material. 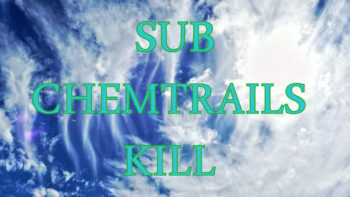 Next four photos can be seen on Jims website http://www.chemtrailsavca.com/. 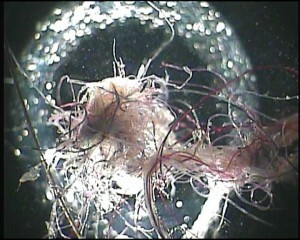 This is an example of a craft expelling unknown material. In the last photo you can see the craft begin to dissipate. This is a good example of the nanotechnology I spoke about. These triangular objects / craft when they dissipate into particulates will reform over and over again repeating the process of expelling this material. These actions can be replicated in photos of different craft. These photos were taken with a infrared modified Nikon D-70 using a Nikkor 300mm AIS lens. 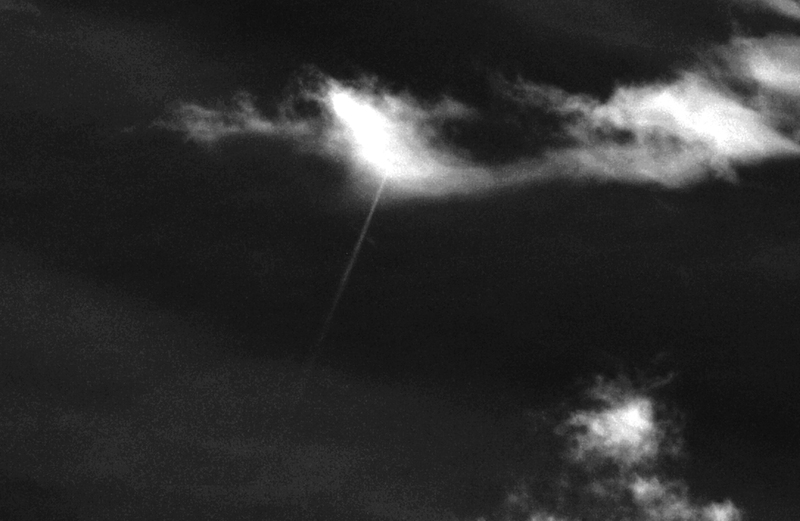 Black visible triangular craft expelling unknown material near chemtrail. First photo. 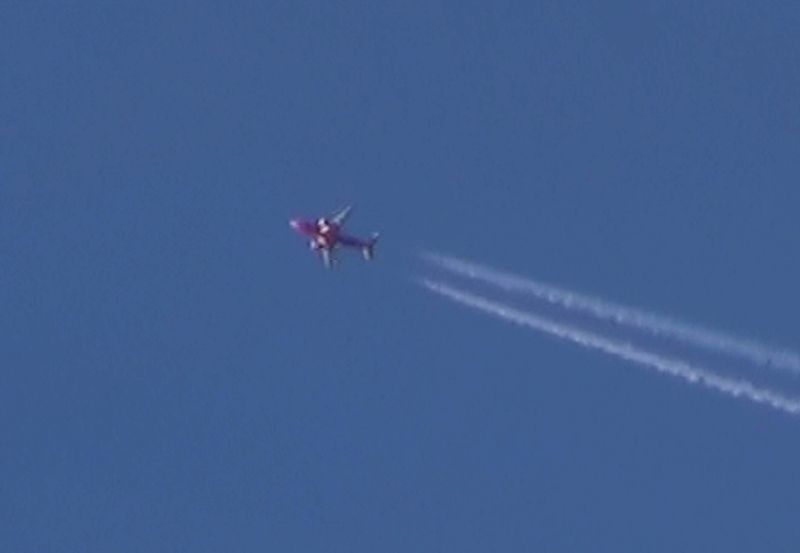 Very strange jet with strange orbs around the fuselage spraying a chemtrail. Next two photos. These are not lens flairs. Three of us observed this object (naked eye) over the military industrial complex in Palmdale. 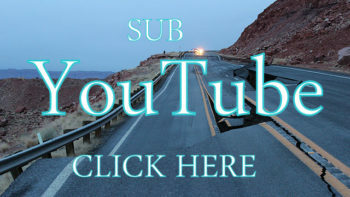 https://www.youtube.com/watch?v=c87L7WAPCcc UFO over Angeles National Forrest south of Antelope Valley. Full spectrum footage. 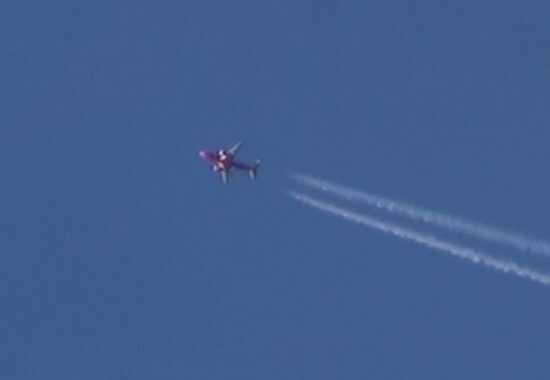 https://www.youtube.com/watch?v=Tpp8zEdc3Ko UFO’s strange attraction to jet spraying chemtrail. Sherry Bunker (aka MsAmericanBunker on YouTube) has a background in healthcare, and currently resides on the west coast, USA. Several years ago, she inadvertently stumbled across the ‘Disclosure Project interviews on YouTube. 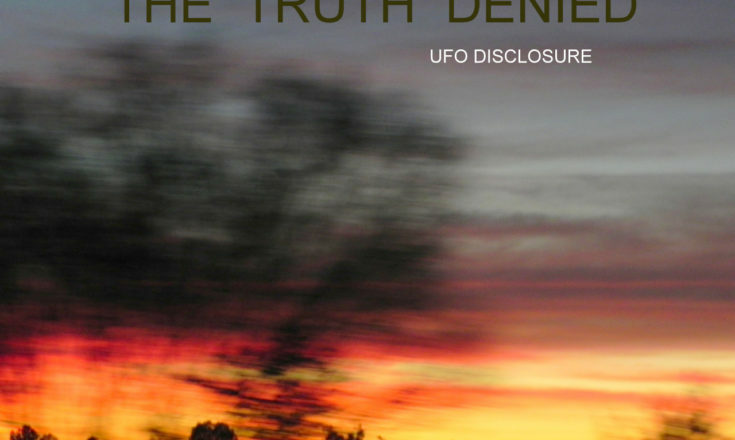 Sherry was stunned at the testimony of so many brave, respected, vetted military and civilian men and women talking of aliens, ufos, underground bunkers, etc. So, she began to watch more whistle blower videos, but also UFO videos from around the world. While grateful for other’s efforts, Sherry was frustrated with many UFO videos that had the same negative characteristics in common: too fast, too blurry, or too far away to be seen. So she found a video software program, and taught herself how to use it. 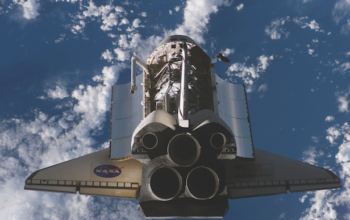 Through trial, error and accident, Sherry has discovered it’s sometimes possible to use basic video software options to detect high frequency presences in the atmosphere of video footage and images. These presences include majestic craft of advanced intelligent beings, the animal like beings that accompany such craft, and the traceable activity of both. Several thousand videos later, Sherry is still sharing freely the knowledge she’s gained, and how others can easily do the same thing. 1. 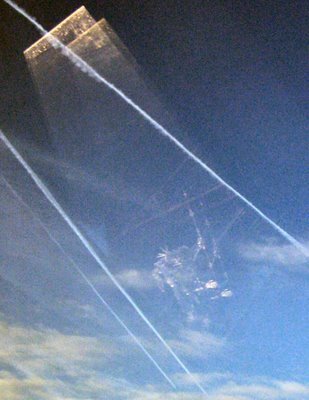 Alien craft has been identified chemtrailing the atmosphere in numerous videos in both the UK and Antelope Valley. 2. Chemtrails sometimes cloak larger alien craft in the sky. 3. 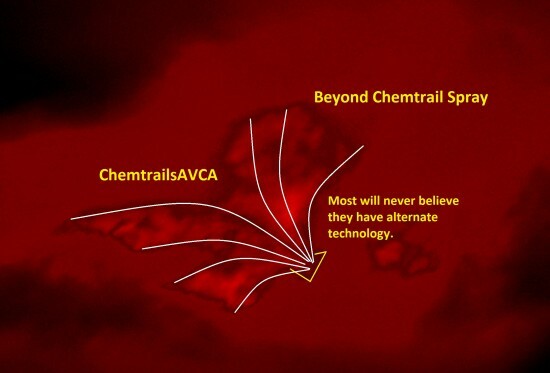 Chemtrails sometimes are used as transport pathways for alien entities/activity. 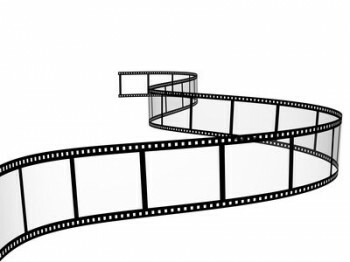 Sherry analyzed the following videos for Jim Kerr, take a look when you have some time! Sean’s observation of the patterns surrounding these crafts helped him to understand a deep underlying principle or symmetry of another kind. “So… when I speak, I’ll probably start by saying that I am going back and forth, but I don’t have the background knowledge to make statements trying to identify these. I will probably also mention the need for the Ole Boy Network to speak up. Like I mentioned on the last show with Jim, I am really stuck on the similarities between the craft and the triangle with the eye. Either the craft ARE the ancient symbols, or the craft were made to look like the ancient “Horus”, etc., to set up BlueBeam. I will mention the Temple at Abydos too. ATTENTION! Want to hear more interviews of this type ? Film Maker Jose Escamilla, Bill Bryson & Sean Gautreaux talk moon,rods,and upcoming films! 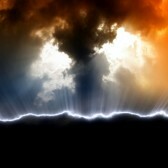 Dr. Chuck Missler videos on fallen angels and demons. Quite a history lesson. After listening to your questions poised in this interview it occurs to me that what I’m teaching right now on Revelation answers a number of questions you ask. I have 2 videos published, but I’m on video 64 at the moment all at approx 40 minutes length. I can provide them on a USB Drive as they’re in HD format and take up a lot of disk space. So relieved to know I’m not crazy. I am very scared concerning these chemtrails. No one wants to believe me. It can’t be good. What if anything can we do to stop it? Also I feel the UFO s are concerned for us. NO, you are not crazy, but suppression of information sure can make you feel like you are losing your mind! You are not alone Carol, thanks for writing in!